Image caption It was a 'smart idea to do it all as a rap,' says one tweet - perhaps they should call it Hamillton? Spoiler alert: The latest Star Wars movie features a 7ft Ewok and cameos from Kirk, Spock, Scotty and Bones. At least, if social media is to be believed. 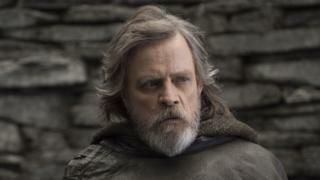 Star Wars: The Last Jedi had its European premiere on Monday and was released in the UK today, with some people pledging to stay clear of social media to avoid having the plot spoiled ahead of seeing the movie. But some Twitter users might have made it easier to dodge any twists by flooding social media with make-believe spoilers of their own. This includes Daniel Carlson who tweeted a laundry list of so-called spoilers, including what he called a "bold" choice of music for the end credits. His post inspired many others, and one of the biggest stars in the film series joined in on the joke. Another user suggested a 7ft 3in (2.2m) basketball star's cameo as an Ewok "seemed off", while some may have gotten slightly confused with a different 'Star' franchise, or Disney's Marvel Cinematic Universe (famed for their end-credit scenes). One person referenced the reaction on social media to Disney-Pixar film Coco, which was preceded in the United States with a 20-minute film featuring Olaf from Frozen. Although Star Wars producer Kathleen Kennedy previously announced Jar Jar Binks, who first appeared in The Phantom Menace in 1999, would not appear in The Force Awakens, an appearance in The Last Jedi was not ruled out. And at least one person recast the role with Ryan Reynolds, star of Deadpool and Green Lantern. Meanwhile, one group of people who may not have to wait as long for the film as they first thought are the astronauts aboard the International Space Station, where Nasa plans to send a copy of the film. And with ISS internet speeds "worse than dial-up," according to retired astronaut Scott Kelly, the astronauts of Expedition 53 may have to avoid social media for some time to remain completely spoiler-free.